An orangutan pack is ruled by a king. The king is the strongest male in the pack. And another adult male may challenge him for the position. 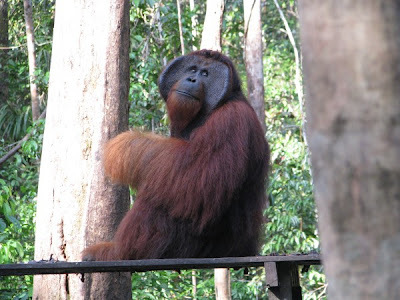 The former king of Camp Leakey pack was Kosasi. He'd been ruling his pack since 2002 to 2007, and was replaced by another male orangutan called Tom. Exactly five years. Just like the local governmental election--minus the chaos. However, Tom's fight for power was not without intrigues. According to Yusup, one of our guides, Tom had challenged Kosasi, several times and failed. One day, Kosasi broke his left arm, presumably due to a fight with another pack leader. When Kosasi passed a trail from the forest to the rangers' hut, Tom was waiting. A true Machiavellian, Tom seized the moment and challenged Kosasi. Being the king, Kosasi had no choice but to stand and fight like one. And it was a brutal fight. Yusup witnessed it firsthand, as the two exchanged rock-shattering blows. Tom hit Kosasi with full force and broke an ironwood tree branch which supported him. With a big handicap, Kosasi stood no chance. He suffered severe injuries, including several broken ribs and fractured spine. The rangers had to sedate and take Kosasi to the rehabilitation center. It took him a whole year to recover to full health. This was probably Tom's reaction upon hearing the news, "Pfft. Humans." As seen on the picture above, a king has wide cheekpads. Every male orangutan grow their cheeks to become pad-like related to their morale. If a male keeps winning fights and become more confident, his cheeks can grow rapidly. Tom's cheekpads, for instance, grew tremendously in one year, after defeating his father. The opposite applies. Miki, another guide, told us how one male stopped growing cheekpads after keeps getting defeated. The growth may be related to some kind of hormone produced by the feeling of being superior. So the size of these cheekpads can be an indicator of how strong a male orangutan is. These cheekpads also help orangutans make a "longcall", some kind of a summoning wail to his brethren. To me, it sounds like the first syllable of a yodel, but prolonged. 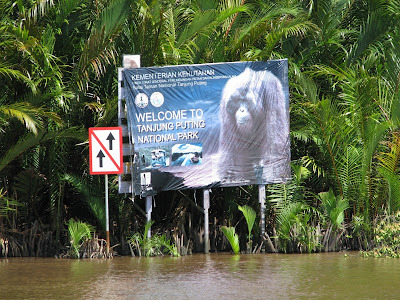 (As a side note, The Yodeling Orangutans is a good name for a rock band.) With wider cheekpads, the longcall becomes more thunderous and echoes through the forest. The king of a pack definitely needs it. Just another proof that nature is actually systematic. UPDATE: Yomie, one of our guides, contacted us to revise the part about Tom being Kosasi's son since that part has a high probability of being false. Tom was born in 1983 and at the time, Kosasi was still a fledgling. Even if Kosasi were an adult at the time, we still wouldn't have been able to confirm that he's Tom's dad from observation alone.